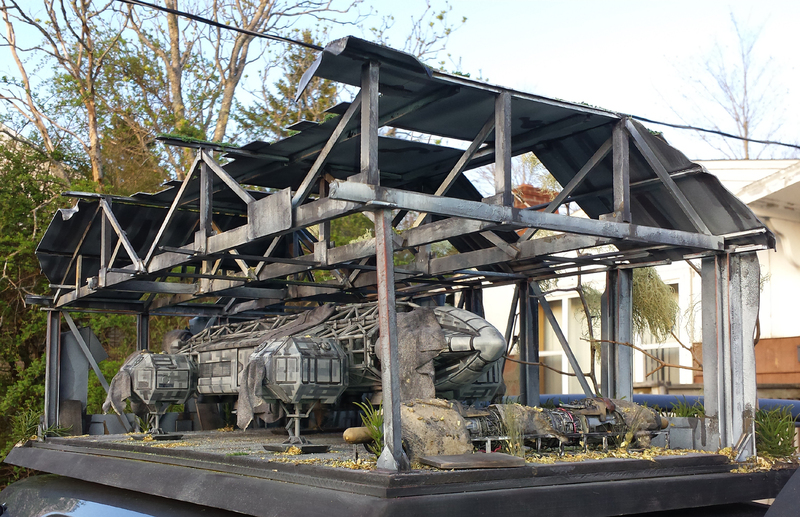 This fantastic Eagle diorama has been making the rounds on the Internet of late. We catch up with its creator, Robert S LePine, to learn more about it. My name is Robert S LePine and I’ve been a professional model builder for over 25 years. Employment (yes we still need a day job) at NEOCON International Pattern Shop Assistant (this company makes the All Weather Trunk/SUV Protectors for most automotive manufactures). 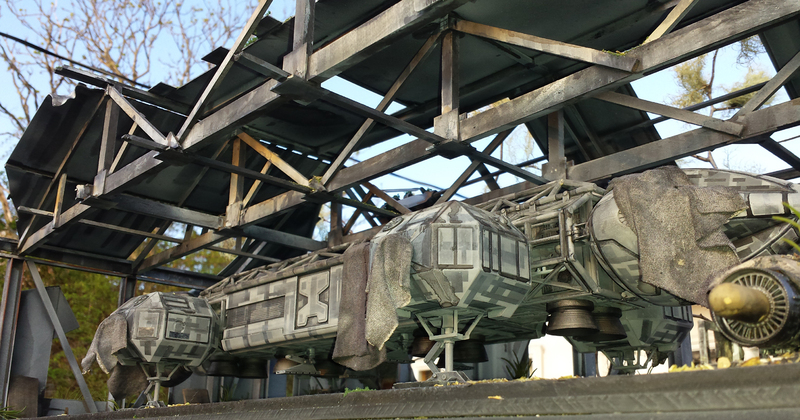 My website is www.nostromobuilders.ca – it’s old, but I can still update it when I have the time. Looking back at how this adventure started, I have to make one confession up front. I knew that everyone would be going bananas doing up their Eagles as great as they could, as accurately as they could, and fast as they could. I walk a different path. I did an old MPC Eagle years ago in a lunar camouflage that I thought really worked. I needed a new direction, so I started looking on the net for lunar images from the moon landings and an idea that might work. Then it hit me. Some of the geometric camouflage patterns that are used on modern combat aircraft (such as an F-18 in war game colors) gave me another direction and hence the second paint job began. After many hours of masking and painting, masking and painting and did I mention, masking and painting, this was the result and I HATED IT! I want to make it known that this model was a mistake from day one, nothing went right. However, thanks to comments, inspiration and the fact of how important this kit was to me, I never gave up, and this DIO was an evolution of that NOT GIVING UP! Okay, that was the introduction, now for the nitty-gritty. As a pattern maker, I have access to good tools, materials and ways of making almost anything I need for my job, my home and my hobby. This does give me an advantage. 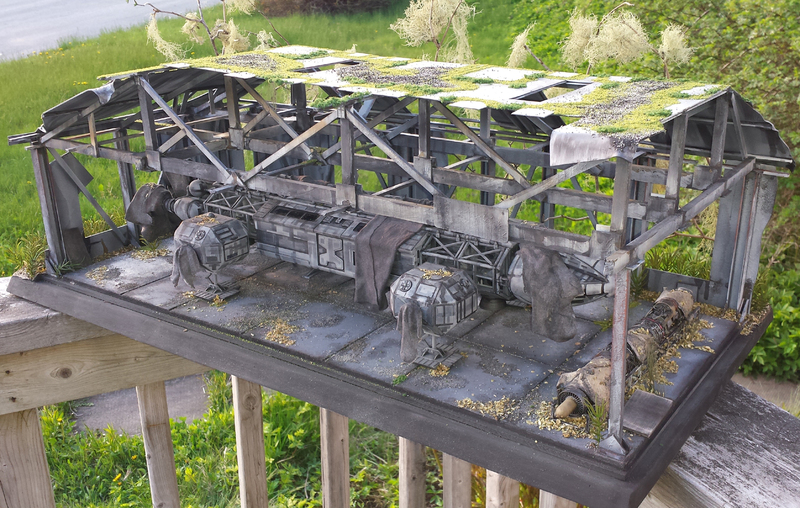 The base of the diorama is 3/4 plywood, with hardwood trim around the outside, sanded, sealed and painted. The floor of the scene is a combination of Lexan, and particle board, to give the concrete illusion I wanted. 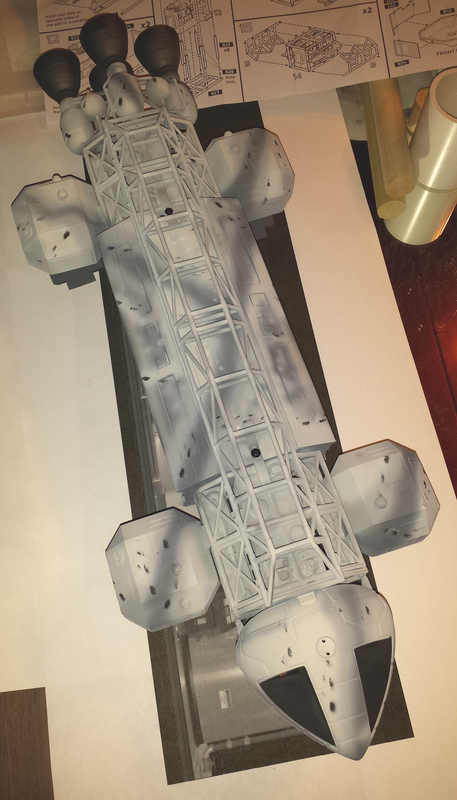 I also wanted a Lexan base for gluing the building too, hence all the layers. The building structure is all 1 cm cut Lexan. Very strong and very flexible and it works great with any type of good solvent cement! 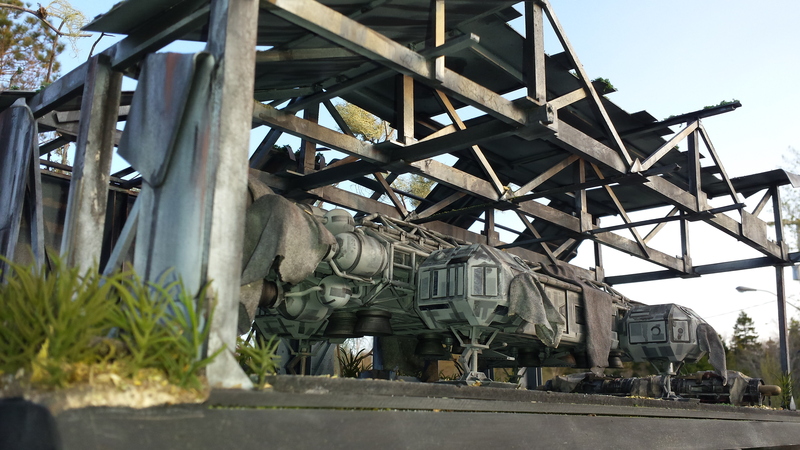 I did my best to try to keep the structure as close to 1/48 scale as I could (years ago I watched and assisted in putting up a building like this). The walls are all sheet styrene, the barrels are Tamiya 1/48 accessories and the little dog came from a ICM 1/48 scale German Luftwaffe Ground Personnel Set given to me by my buddy Greg! 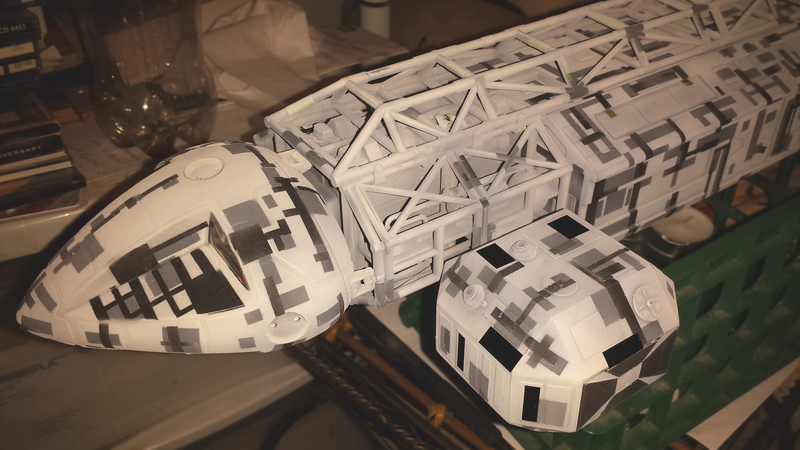 The kit was built straight out of the box with no modifications, no lights, nothing…what you see is what you get. Display, basic architectural building techniques, remember use a square and a small level and you can do no wrong. 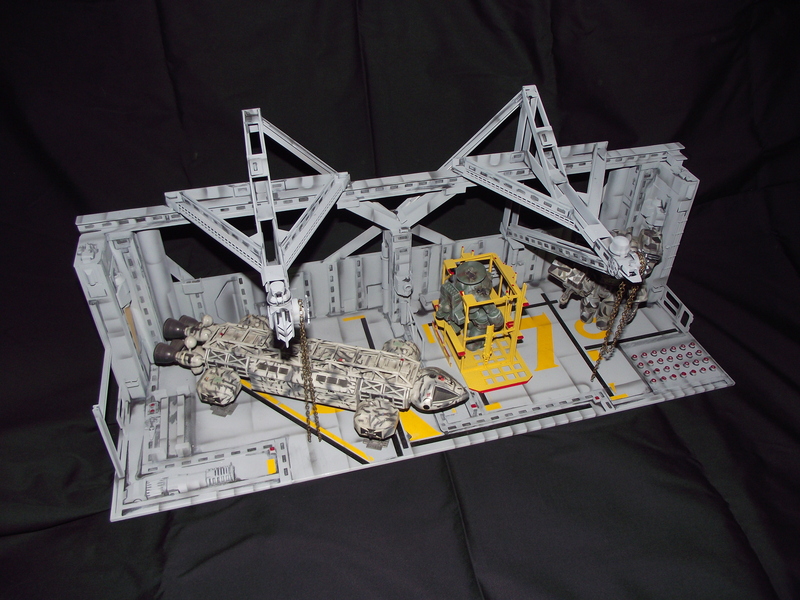 If you have access to Industrial Plastic supply operation WELD ON #3 is what I use for all my model assembly work as it’s great on Styrene, Lexan, and most plastics (though I will warn you that it will destroy the old Airfix plastic that was made prior to the mid 1970’s). Ageing has been a process of trying everything, from Enamel blackwash in the tight areas, to acrylic washes overall and then using glass cleaner and Q-Tips to clean up the staining effect. The real secret is using Pastels in black, rust brown and scraping them to powder form, then using any brush you wish rub it on the model where you wish. If there is a problem, glass cleaner will remove it and try again. Dullcoat through your airbrush will seal the pastels to the model and for heavier staining with the pastels, just rub on the model direct from the stick, rubbing down in the direction of gravity with your fingers, Q-Tips, and brush to effect. There’s a lot of trial and error, so don’t be afraid to just do it and see what happens! 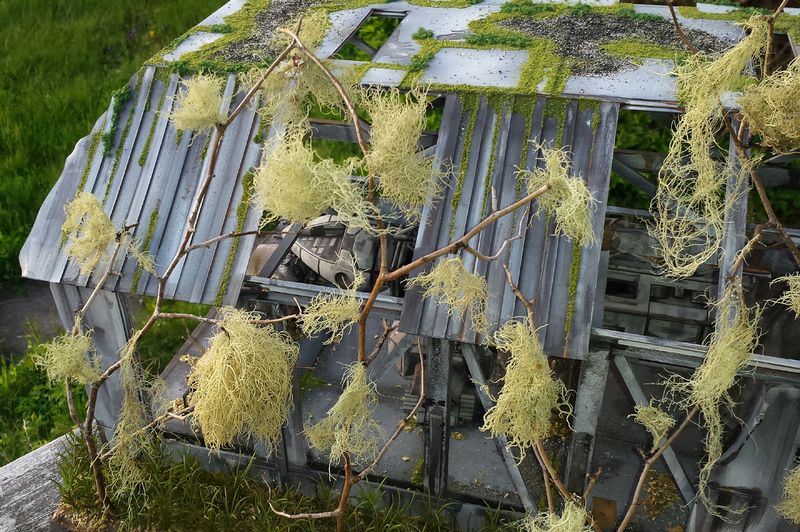 All of the scenery was a combination of toy plants (from the dollar store) Railway Ground Scenic’s, Celluclay, enamel and acrylic paints and yes, twigs and branches from the back yard! And to stick them to the scene? Carpenters Glue, CA glue, both thin and thick. 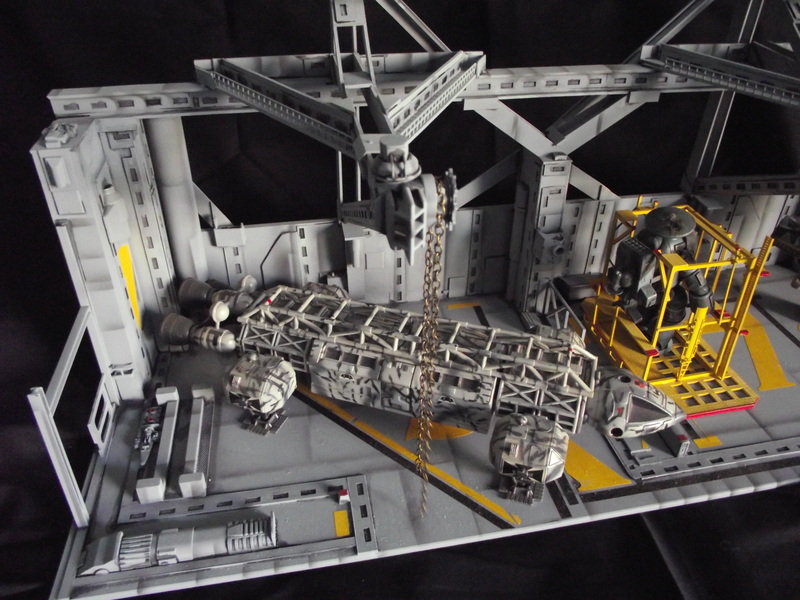 For more of Robert’s work, check out www.nostromobuilders.ca ! Previous article Terrahawks: Volume 1 Imminent!